Internet of Things technologies can be used to make cities smarter. We are currently developing IoT solutions for three aspects of smart cities – Security Threats and Terrorism, Increased cost of operating the cities different infrastructure maintenance and Citizens’ demands for healthier environments. City centers should be places very people can gather together, socialise and enjoy entertainment,culture and sports. Unfortunately during the last years large crowds have become a main target for terrorist attacks, suicide bombers and truck attacks have happened in several European cities including Stockholm. At open air events and concerts sexual haressments and other security threats regularly take place. IoT solutions are needed for surveillance of critical spots without violating citizens privacy, for early detection of ongoing attacks and for fast situational awareness when attacks have happened. We are part of one of the largest European projects on deployment of IoT solutions in large scale applications. Focus of the Monica project is to deploy wearable IoT technologies together with the latest sound management technologies to improve security, sound disturbance and user experiences at large out door events such as music concerts, sports games, street festivals and other outdoor shows. Handling the crises faced by modern societies often requires the coordination of multiple types of stakeholders from different countries. One of the key requirements to manage crisis is to have access to situational awareness through ICT solutions. Together with a consortium of European emergency practioners, rescue operators, first responder organisations we are working in the Sayso project to define a new IoT based reference architecture for such system to be used in emergency situations involving many citizens. A city relies on its different infrastructures like the traffic system, sewage system, water and electricity networks. Today cities are faced with the fact that these infrastructures are getting older and older and the cost of maintaining them are increasing fast. Roads and bridges are critical infrastructures in a city. Repairs and maintenance work immediately effects the traffic situation. Manual inspections of road and bridge conditions are costly. 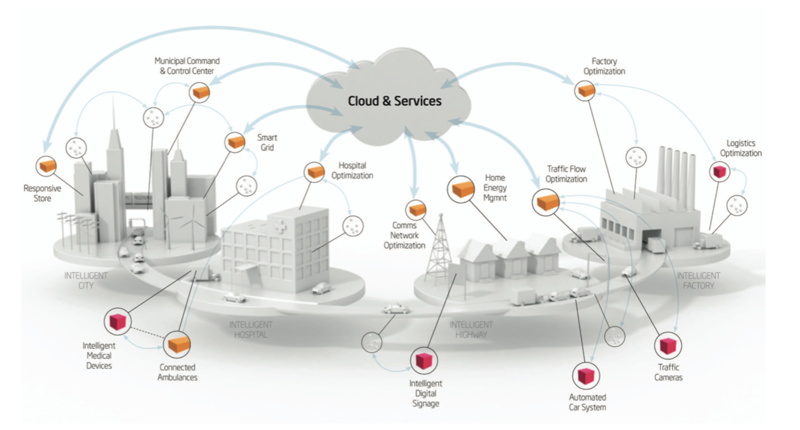 These problems are tackled by the IoTBridge consortium in which CNet is a part. We are combining different types of sensors embedded into wireless sensor networks which exchange information utilising cloud technologies. Data on the use of bridges and status of various parts is analysed to optimise inspection intervals and maintenance to reduce the costs for upkeep and ensure safety. A first installation of the system is done at the new Årsta Bridge, a railway bridge in Stockholm. The vertical and horizontal acceleration as well as temperature are continuously measured, and made available to bridge engineers and inspectors in smart phone apps. In the city of Turin we are developing a service delivery platform that integrates City Information System with Internet of Things technologies for sensing and actuation to support green and sustainable Smart City applications. The collected IoT Data is integrated with the business and organizational data in the city´s operational systems. This enables improved and more efficient business processes that will help the city deliver better services to the citizens. The ALMANAC Smart City Platform collects, aggregates, and analyses real-time data from heterogeneous sensors and actuators to support Smart City processes. CNet is researching and developing a federated storage architecture for big data processing and advanced resource and service catalogue functions to support semantic interoperability of heterogeneous resources, devices, and services. Together with the cities of Turin and Manchester we investigate how to optimize the energy system in a city and its different districts. This involves using IoT middleware to combine real-time data from sensors and meters with different data sources like Building Information Systems, Geographical Information Systems and Energy Performance data. Energy Benchmarking and Forecasting are under development as well as sophisticated visualization techniques to increase users’ interest and awareness of their energy consumption.